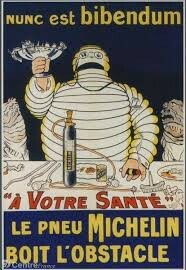 Courmes and advertising: Forerunner ? Pop star before others ? 7th, Issue. “ In our present life are themes of ideas and thoughts delivered by the “intensive” advertising mania of the time (expressed in 1936) and they deserve to be assimilated by the painter. 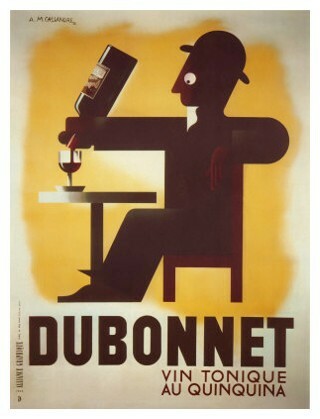 Poster designers owe much to painters, samewise, painters can gather a lot of valuable information by consulting these masters of modern posters like Loupot, Paul Colin, Cassandre or Jean Carlu. 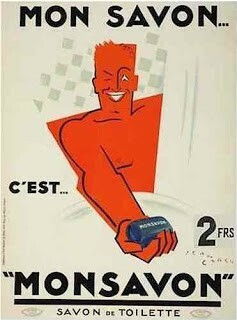 An invention like Dubo, Dubon, Dubonnet, a poster like the one of the soap Monsavon do not only seduce the crowd, but have also an effect in Artists minds” Talks with Alfred Courmes, reported by René Barotte, The free man, 1936. 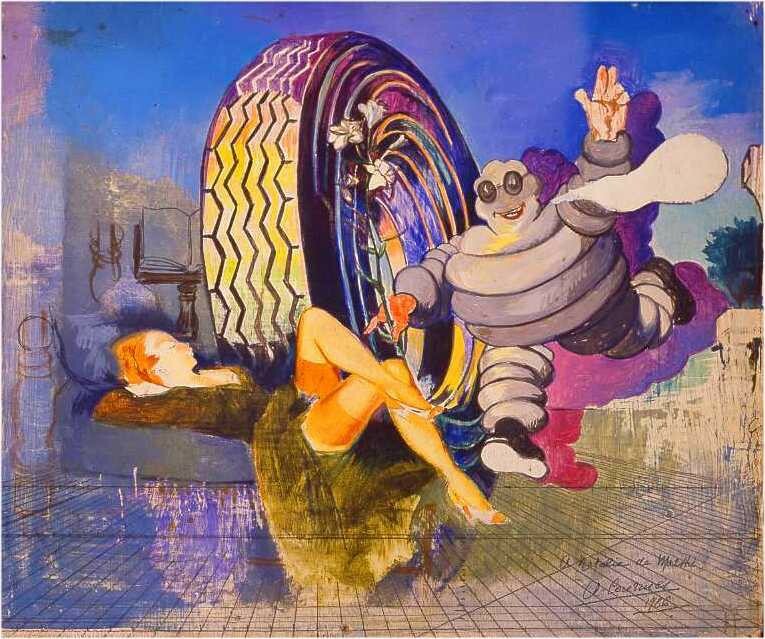 “Alfred Courmes will not borrow ideas from these masters of wall posters, but among what was the most popular art in street advertising (….) 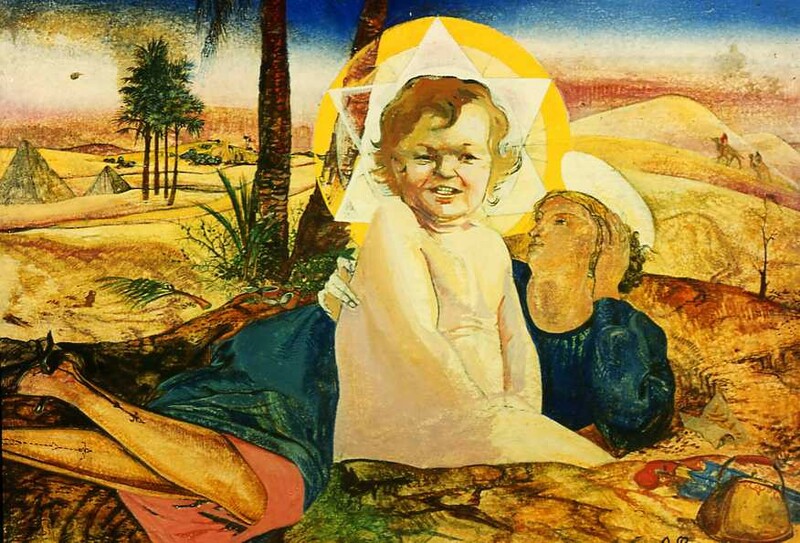 Twenty years later, his ideas will be retained by the Pop Art movement” Michel Wlassikoff, Jean-Pierre Bodeux, in “The fantastic and exemplary story of baby Cadum”, Syros-Alternatives editor, 1990. 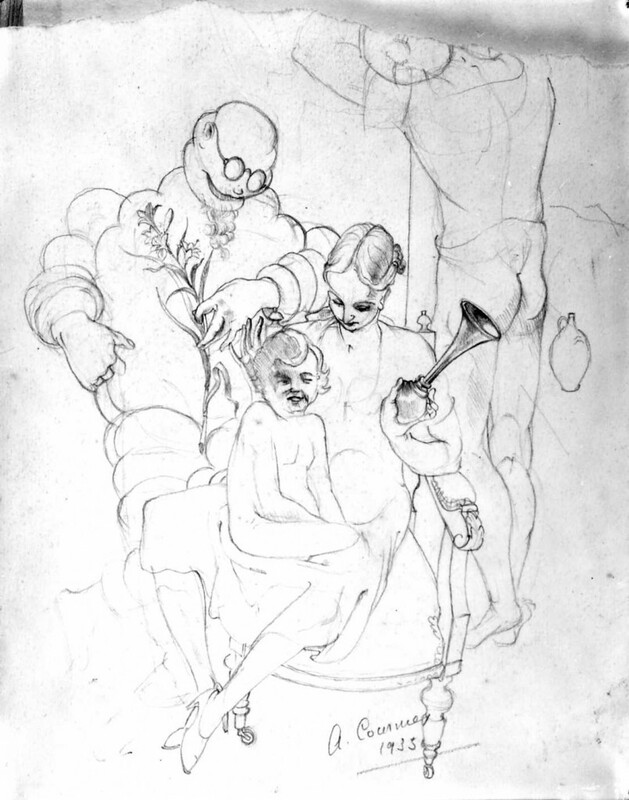 The Bibendum appears suddenly in preliminary drawings, drafts of 1934 and 1935. 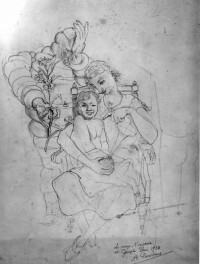 They are preparing the “Holly Family” painting. 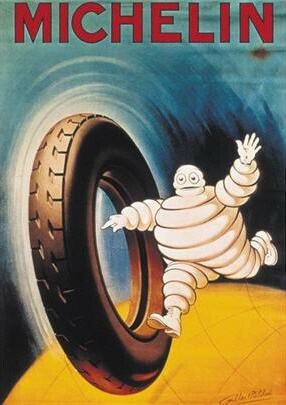 Joseph is represented by the Michelin Bibendum and the Holly Child under design of the Cadum baby. But one will wait till 1968 to see these advertising emblems in a finished work. Gabriel angel will be represented as the Bibendum where the Holly Virgin will appear like another emblem of advertising, the pin-up girl of Schweppes Indian Tonic water. 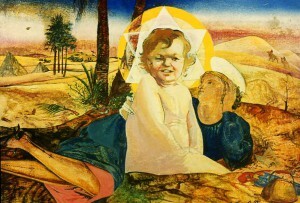 A preliminary work on this subject dates back to 1948. Thirty years will have been necessary to bring the idea to perfection. “Courmes thinks that a good joke must not be understood right away, even partly. 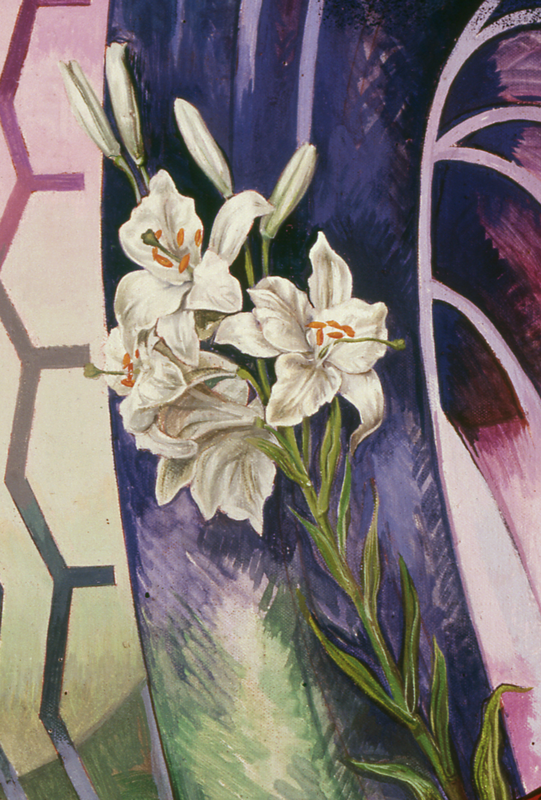 Nevertheless, this painting was in 1968 mentioned in the exhibition catalogue (Salon de Mai) with the following comment: “The connoisseur and amateur will kindly notice that the angel extends a lily flower, designed and painted with peculiar care. The important point is the lily.” To say the truth, this does not clarify things, but causes the artist a pleasure on the literary ground. 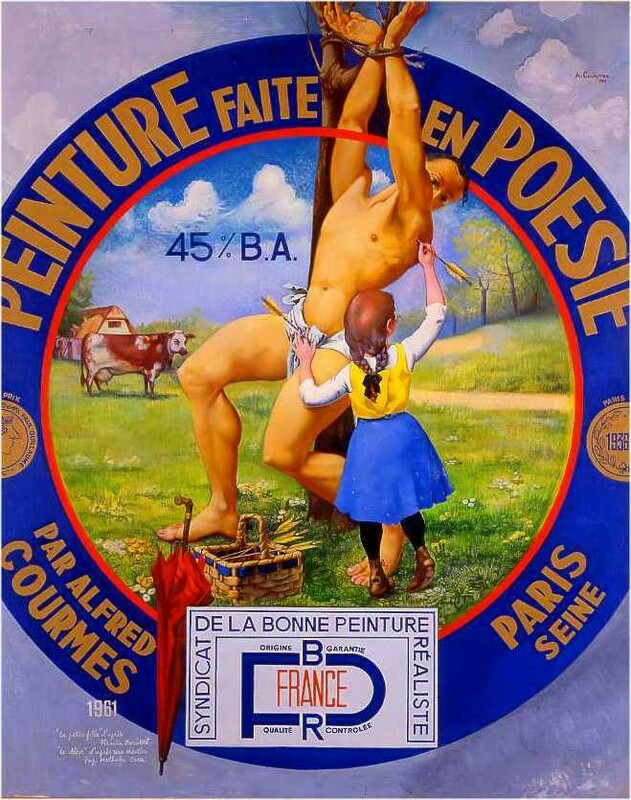 He names these texts “my little poems” and he takes time to think about them, would they be incorporated in his paintings or not” Jean-Marc Campagne, Alfred COURMES, Prospecteur de mirages entre ciel et chair. Eric Losfeld editor, 1973. 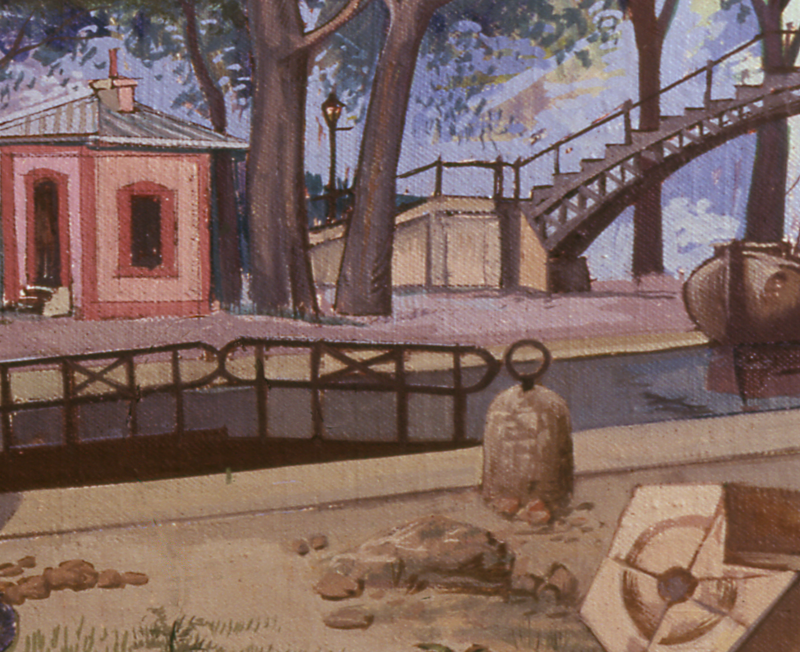 This painting, deposited at theRoubaix museum “La Piscine” is unfortunately not shown in public exhibitions. “ Not caring for classical painters, Courmes does not care as well for emblems of his time, such as advertising….” Extract of the foreword by Michel Onfray, for the book of Vitalie Andriveau – Gilles Bernard, Alfred COURMES, cherche-midi editor, 2003. 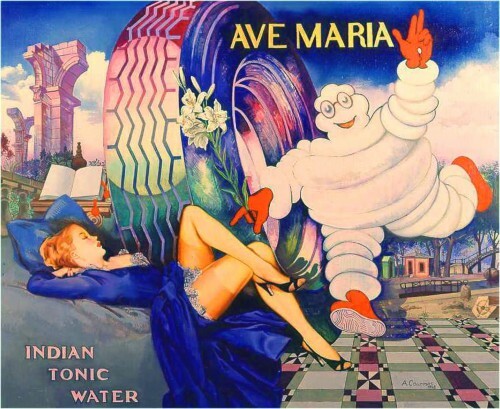 The symbolic behind the representation of the angel as a Bibendum could come from the greek word pneumatikos, the breathing, the spirituality … For those who want to know more, see the text of Denys Riout (text in french), philosopher of art. - 1968, WWIVth Salon de Mai, from May 4th to 26th,Paris. - 1977, “Mythologie quotidienne”, 10th Biannual exhibition of¨Paris, Palace of Tokyo, from September 17th to November 1st,Paris. - 1977, Private exhibition, Gallery Jean Briance, October to November,Paris. - 1979, “French Art”, Serpentine Gallery,London. 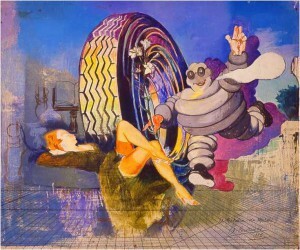 - 1979, Retrospective, Paintings Museum, from May 16th to August 20th,Grenoble. - 1989, Retrospective, Sainte Croix Museum, from July 3rd to September 4th,Poitiers. - 1989, Retrospective, Georges Pompidou Museum, from September 12th to October 22nd, (except on October 5th due to a strike of the museum staff)Paris. - 1989, Retrospective, Saint Roche museum, from October 21st to December 17th, Issoudun. 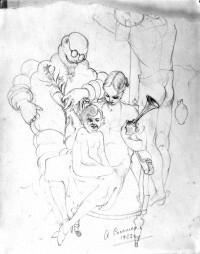 - 2009/2010, « Voyous, voyants, voyeurs », Clovis Trouille time (1889 – 1975), Louis Senlecq museum of Art and History, from November 28th to March 7th, L’Isle-Adam. - Jean-Marc Campagne, Alfred COURMES, Photographs by Robert Doisneau, Jacqueline Hyde, Marc Vaux. Eric Losfeld editor, 1973, page 53. - Vitalie Andriveau – Gilles Bernard, Alfred COURMES, foreword by Michel Onfray, cherche Midi editor, 2003, pages 142/143.